As an horological highlight in the Heritage Chronometrie Collection, Montblanc’s new ExoTourbillon Chronograph combines two of the most important chronometric complications: a chronograph to measure the duration of brief intervals and a patented tourbillon construction for absolute precision. As a consequence of the architecture of a classically constructed movement, the balance’s centre of gravity temporarily strays from the axis of rotation due to the influence of Earth’s gravitational force, which is particularly troublesome when the timepiece is in a vertical position. A tourbillon mechanism compensates for this centre-of-gravity error by enclosing the escapement inside a carriage or cage that continually rotates around its own axis. Gravity’s accelerating effect during the first 180 degrees of the carriage’s rotation is offset by a corresponding deceleration during the second 180 degrees, so the watch’s average rate remains constant. Montblanc installed a large, massy, screw balance in the Heritage Chronométrie ExoTourbillon Chronograph. In a traditional tourbillon construction, this large balance would require a correspondingly large and heavy rotating cage. But the innovative mechanism of the ExoTourbillon solves this problem by isolating the screw balance from the rotating cage. The cage is smaller than the balance, which oscillates outside the rotating carriage and on a higher plane. isolated from the rotating carriage, is not disturbed by the inertia of the carriage. Compared to a traditional tourbillon construction, energy savings of approximatively 30% are achieved, while at the same time increasing the precision. This innovative construction derives its name from the Greek prefix “exo”, which means “outside” or “external”. 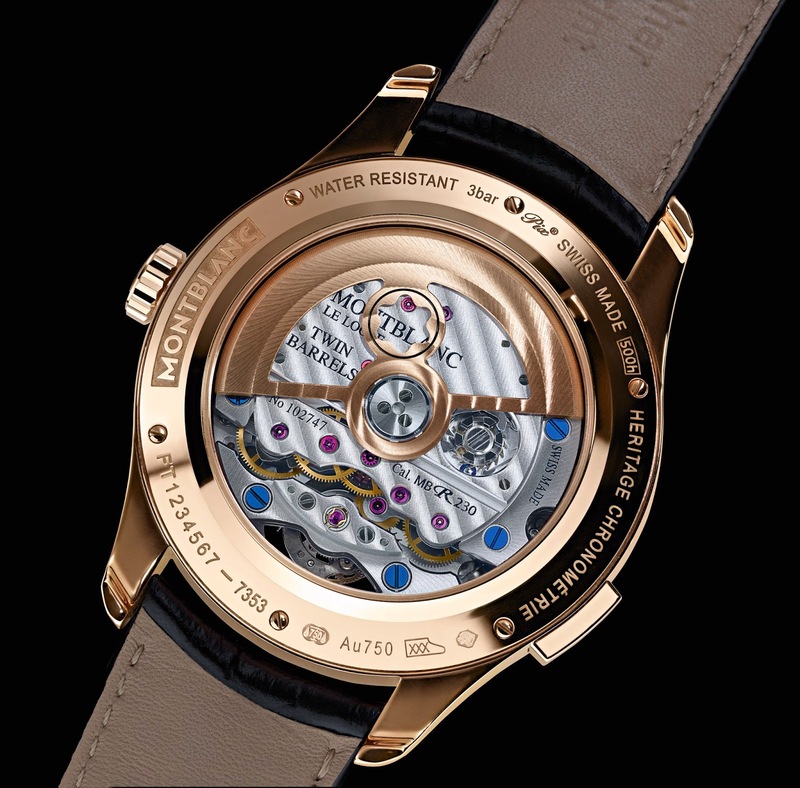 With this patented ExoTourbillon construction, Montblanc offers for the first time a stop second function that directly halts the screw balance by means of a tiny spring. Such a construction rarely accompanies a tourbillon and is very useful whenever the wearer wishes to precisely set not only the hour- and minute-, but also the second-hand. 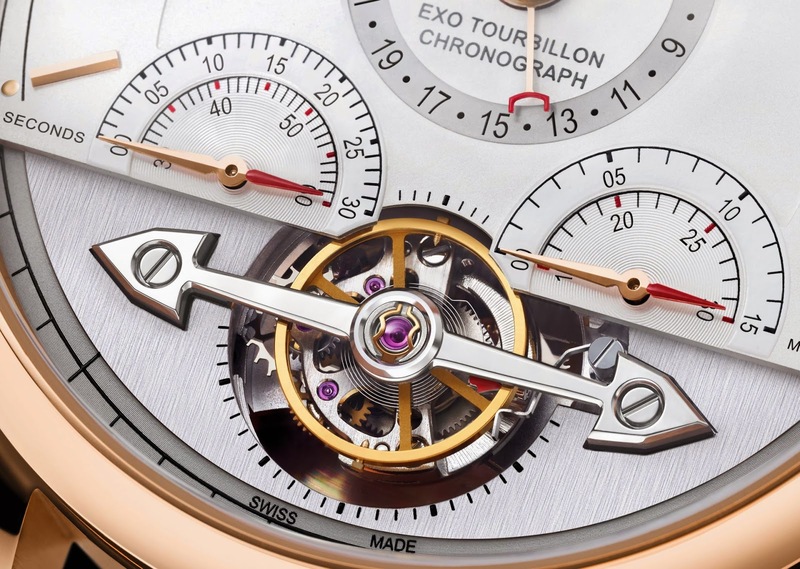 Directly halting the balance in a tourbillon is a more precise construction than arresting the second-hand by halting the rotation of the tourbillon’s cage because the former instantly stops the balance and prevents the “after-swing” that can occur when the tourbillon’s cage is stopped. In order to precisely adjust the time, the tourbillon cage wheel integrates a red marker in form of an arrow, which allows to read the seconds on the respective scale printed on the opening of the dial around the tourbillon. 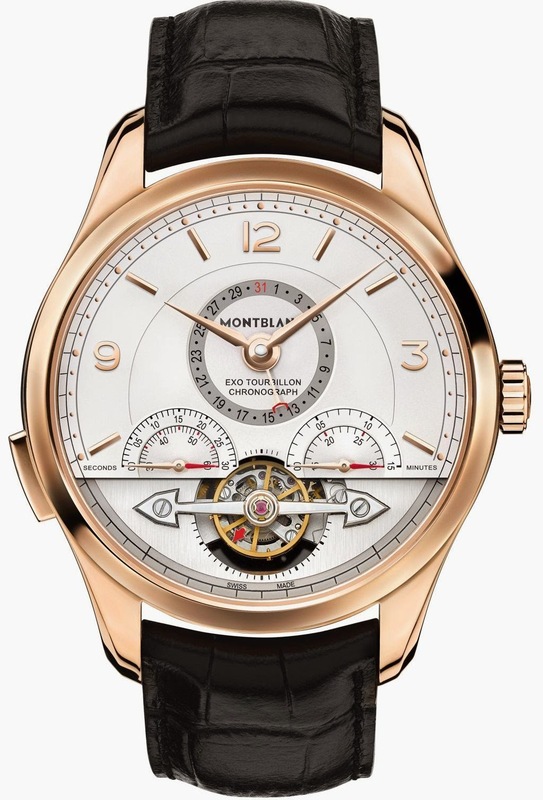 This innovative Tourbillon construction is integrated in Montblanc’s own in-house developed chronograph calibre that combines all the elements of a traditional chronograph with a contemporary highly performant construction: monopusher with column wheel, efficient and precise vertical coupling, automatic winding and two barrels. Two semicircular counters with hands of different lengths to match the appropriate sectorial scales, enable the Heritage Chronométrie ExoTourbillon Chronograph to tally elapsed seconds and minutes. 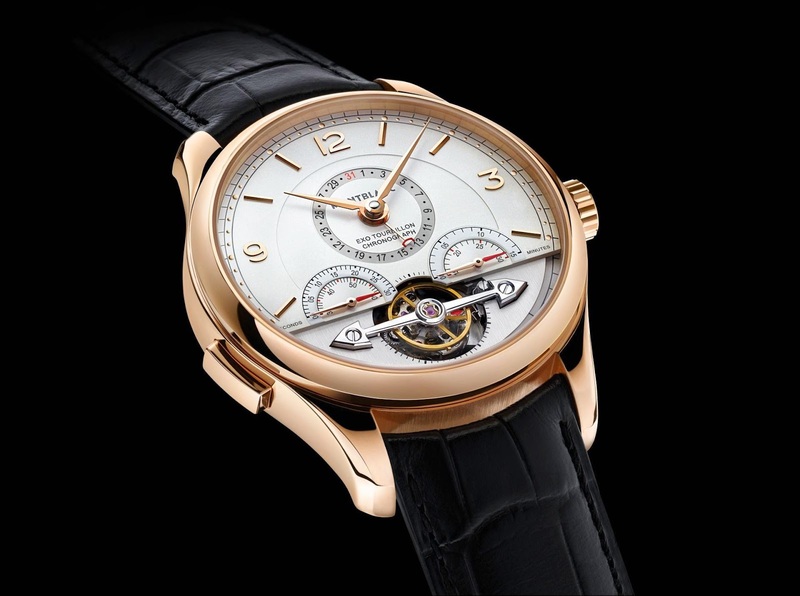 These counters are embedded on two levels into the complexly designed and elaborately crafted dial, which also bears six facetted, applied, red gold indexes. The aesthetically appealing surfaces are styled with refinement and crafted with much love for detail. The date is indicated by a hand which extends the dial’s centre. The tip of this hand points to the current date on a circular grey scale. The hour-hand can be reset in hourly increments, thus ensuring quick and uncomplicated time setting, for example, when travelling. Repositioning the hour-hand has no effect whatsoever on the minute- and second-hand, so the precise time is always preserved. To set the date display, the user advances or retreats the hour-hand through 24 hours. Whenever this hand’s tip passes the 24th hour, the hand of the date display either advances or retreats accordingly. Different from the other models in the Heritage Chronométrie Collection, the Montblanc ExoTourbillon Chronograph relies on a slightly different case construction. The bezel is not flat, but concave, which creates an attractive aesthetic effect and simultaneously protects the bezel against scratches. The facetted horns are satin-finished on the inside and polished on the outside. Montblanc’s emblem, crafted as a distinctive relief atop the crown is a distinguishing feature of the entire collection. The leather strap is made at the Montblanc Pelletteria, the Maison’s own leather manufacture in Florence, Italy. This timepiece is available in a 44-mm-diameter case crafted from 18K red gold.